Stacks of wax and pages of POWERful superheroes! Donald Kasen, CEO of Inspired Studios and Power Records, joins me for a time-traveling trip to the swingin’ 70s…when vinyl was in vouge and Power Records were twirling on our turntables! Airship 27 Podcast #22: Farewell, Van Williams & Rob is Santa! Captain Ron Fortier and Chief Engineer Rob Davis return with the final Airship 27 Podcast of 2016! This month, they discuss the sad passing of Green Hornet actor Van Williams, several of their latest releases including Captain Hazard Vol. 5, Rob playing Santa, Ron’s 70th birthday celebration, and much more! Come aboard the fabled Airship 27 for one last ride in 2016! The crew returns! This time they discuss the latest comic book movie, SUICIDE SQUAD! What did our fearless hosts think of the film? Listen to find out! Plus, they discuss the latest news from in and around comics, and how Ron got his face on Bleeding Cool! And what Zone 4 episode would be complete without a few rants and tangents? Facebook Shout-Outs makes a comeback as well, and much more! She shared the screen with the Dynamic Duo, Green Hornet and Kato! Now, actress Diane McBain shares some time with us in the Lair to chat about her TWO tales on the classic TV series, Batman! 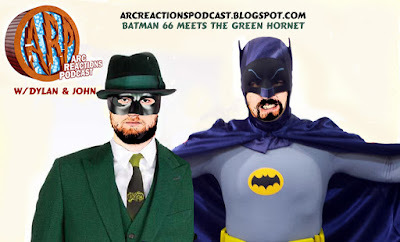 Comics in the Golden Age Podcast Episode 18: The Sting of the Green Hornet! Mike and Chris explore the seedy underworld of the Green Hornet! Let’s roll, Kato! I’m hittin’ the streets in the Black Beauty with none other than the Green Hornet himself, actor Van Williams! In this rare interview you’ll hear ONLY on Comic Book Central, Van talks about fighting fictional crime on TV with Bruce Lee, Adam West and Burt Ward…and battling the bad guys in real life! Comic News Insider: Episode 527 is now available for free download! Click on the link or get it through iTunes! Sponsored by Dynamic Forces. Jimmy is again joined in studio by playwright extraordinaire Qui Nguyen (Vampire Cowboys Theatre Co.). They chat about Anne Rice’s return to vampires and if you should laugh at every joke. Lots of reviews this week including a few TV shows and movies. Jimmy saw two in one day! News includes: A new Kill Shakespeare comic series is coming, Cartoon Network greenlights Black Jesus, The Walking Dead mobile game is on the way, Harlan Ellison’s Star Trek script coming to comics, Batman and Green Hornet reunite in comics, Boom! gets first look deal with Cartoon Network, Marvel announces documentary series, and BBC America premieres sci-fi documentary series. As always, Listener Feedback, Top 3 and more. Leave your iTunes comments! 5 stars and nothing but love!